About Us – Galaxy Discount Flooring – Wood Flooring, Carpet, Area Rugs, Tiles and more! When it comes to your personal flooring experience, nobody takes better care of you than Galaxy Discount Flooring. Why? Because at Galaxy Discount Flooring, we treat you like you are a part of the family! Galaxy Discount Carpet/Flooring was established in 2001. Our main Headquarters soars at a 30,000 square foot showroom and is conveniently located at 2608 Berlin Turnpike Newington Ct. We are a family owned and operated business which takes great pride in our reputation. With over 35 years combined experience, Galaxy Discount family is very capable in guiding you with your new flooring project. We devote ourselves to update products, and information in our showrooms with the latest trends. Come in and visit one of our 2 locations and experience personal shopping at DISCOUNTED PRICING. We offer all name brand goods, at very affordable budgets. Come in today visit our PROFESSIONAL Showroom and GIANT IN-STOCK BARGAIN BASEMENT with all the latest fashions in flooring from all the top leading manufactures. From Carpet, Hardwood, Laminate, Tile, and Luxury Vinyl Flooring. Both for Residential, as well as commercial applications. We Are Your One-Stop Total Flooring Store! 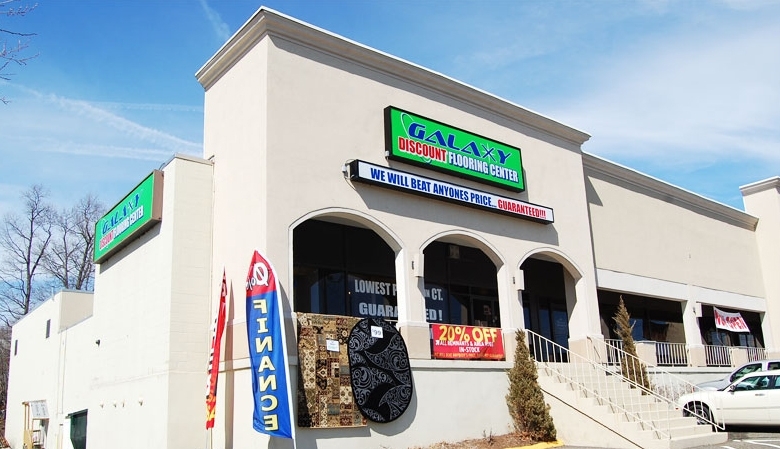 Galaxy Discount Flooring Center is a retail and commercial flooring store that services the entire Connecticut area! We also provide services to New York, Massachusetts, and Rhode Island. Galaxy Discount Flooring DOES NOT SUBCONTRACT. All of our installers are in house. We stand behind our work with a 5 YEAR SERVICE WARRANTY. No job is too small, and no job is too big. Galaxy Discount Flooring is organized, punctual, and most importantly determined to raise the bar with each and every installation. Galaxy Discount Flooring is your one-stop source for floor covering, and decorating ideas for remodeling a home, office, kitchen or bathroom. Our showroom offers quality products from exclusive HGTV Flooring Line, Mohawk, Shaw, Beaulieu of America, Southwind, Couristan, Tuftex, Fabrica, Radici, Kraus, Happy Floors, Daltile, Bruce, Anderson, Armstrong, Mercier and more. We proudly offer Connecticut the best quality and variety of home design solutions at unbeatable prices. Galaxy’s experienced staff will help you choose the right floor – carpet, wood, vinyl or tile – for your home or business. We buy carpet by the truckloads and stock pallets & pallets of hard surface flooring. That is why we are able to pass the savings on to you. WE GUARANTEE TO BEAT ANY COMPETITORS PRICE!! That is the GALAXY PROMISE. You Can Save 40-70%OFF On Carpet Every Day! What separates Galaxy Discount Flooring from our competitors is that we have over 200,000 square feet of flooring in stock at any given moment between the two locations. Which gives us the upper hand, to sell mass quantities at DISCOUNTED PRICES. Diverse styles and qualities at unbeatable install packages. We offer “Next Day Installation” on all in-stock carpet. Galaxy Discount Flooring Center offers exceptional flooring services. Conveniently located in Milford, CT, to serve our New Haven, Fairfield and Litchfield clients. With over 20 years of experience in the flooring industry, we can provide your home with the highest quality flooring products and installations for unbeatable “OUT-OF-THIS-WORLD” prices. Come to us for reliable workmanship and attentive customer service. That’s the Galaxy Guarantee! As family, you’ll get the best we have to offer. The best materials, craftsmanship, price and service. The Galaxy Guarantee! Every time. We understand that having new floors installed or refinished in your home can be stressful. That’s why we strive to create an enjoyable experience from initiation through completion. Galaxy Discount Flooring Center is a family owned and operated company. With two locations to serve all of our Connecticut Customers, we are conveniently located to serve New Haven, Fairfield, Litchfield, Hartford, and New London County. We are committed to “One-On-One” customer service and quality flooring work. Our team of flooring experts will work with you to ensure you get exactly the results you want. Whether you need to install new floors in your kitchen, living room, bedroom, basement or bathroom, our flooring experts can make it happen. We do not “sub-out” any work, each and every job will be completed by our In-House insured and certified Installers. Do you have a busy schedule? Don’t worry – we work on an appointment basis and we will make ourselves flexible for the convenience of our customers. Call our flooring experts to request a FREE ESTIMATE or to learn more about the flooring services we provide. We hope to help you on your next home improvement project! Understanding your flooring needs is the first step towards assuring your project’s success. Our customers are our most valuable asset thereby making service excellence our very highest priority. From hardwood to laminate flooring, Galaxy Discount Flooring Center sells and installs it all. Let the professionals at Galaxy Discount Flooring Center in Milford, Connecticut, add beauty to your residential or commercial property. We install hardwood, as well as laminate flooring, using products from brands you can trust. Turn to our Flooring Experts and Galaxy’s Certified and Insured Installers when you want hardwood floor installation done right the first time. At Galaxy Discount Floors, we understand that specific needs may vary from one client to another. Our staff is trained and certified to work with all types of flooring materials in order to produce the most appropriate answers to your questions. We provide quality workmanship and innovative solutions to meet your specific needs. Our staff is made up of qualified installers and we guarantee to never subcontract any of our work. In addition, you can rest assured that your services will be done right the first time, as all work is performed with a trained Install Leader on the premises to assure a quality installation.